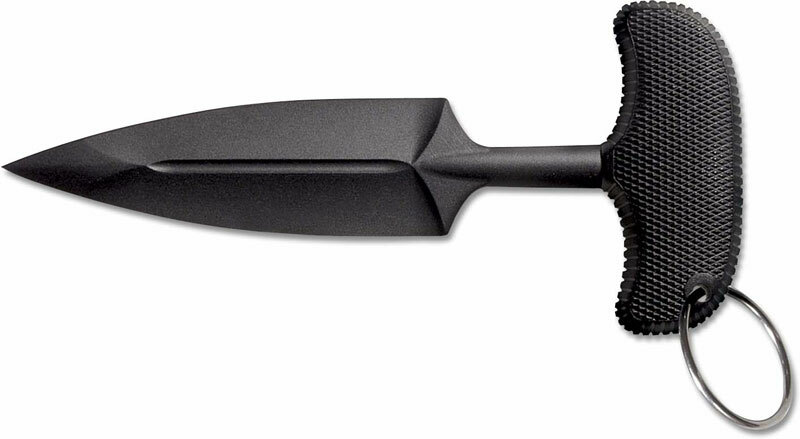 The Cold Steel Nightshade Knives feature single piece Griv-Ex (fiberglass reinforced plastic) construction. The illustrated Cold Steel Nightshade Knife is the FGX Push Blade II Knife with a 3 1/2" blade, 6.5mm thick. The handle area has molded Kray-Ex grips and a metal hanging ring. The Cold Steel Nightshade FGX Push Blade I has an overall length of 6 1/4" and weighs 1.6 ounces. It was a pleasant surprise when i got this in the mail, it's very light weight and would easily puncture through clothes or jacket, however it wouldn't be ideal for cutting as its plastic, all be it very sturdy plastic though, wouldn't recommend you tried stabbing any wood or anything like that because it would get damaged, but it would penetrate flesh fairly easily. all in all a great little weapon to have as a back-up, i'm very happy with the purchase & price & dealer delivered very quick as well.